The latest generation luxury performance touring tire that combines performance tire handling with a quiet, comfortable ride, now with Radial XSE Technology for superior wet and snow traction and enhanced fuel efficiency. 1. Exclusive Bead Tension Structure is the key to performance with comfort. Casing plies wrapped around in opposite directions are flexible for a comfortable ride, yet responsive for steering and handling. 2. BAZ Technology (spiral wrapped nylon Banded At Zero degrees to tire rotation) helps provide consistent handling and precise control by resisting centrifugal forces at high speed. 3. Full-depth sipes provide outstanding wet and snow traction over the life of the tire. 4. 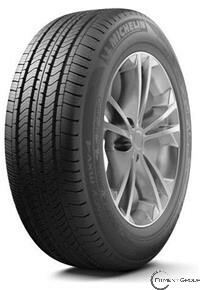 Rounder, European performance tire profile delivers optimum steering response and progressive handling. 5. Green X branding assures consumers that these tires meet stringent standards for wet and snow traction, treadwear, noise and rolling resistance. Radial XSE Technology brings three Michelin breakthroughs to Energy MXV4. Smart Compound improves wet and snow traction, raises fuel efficiency, and reduces emissions. Optimized Casing Design equalizes tire footprint pressure to extend tread life. Optimized Mass Distribution enables the Energy MXV4 to be built with less weight and inertia. So it spins up to speed more easily, consuming less fuel. It stops quicker. Rides smoother. And grips with greater tenacity.